Just a week to go. The weather has been a bit unkind for the past few days but forecast is looking bright, so pack the factor 50 and smart shades. I only have a few bits for you this time. A number of competitors have asked about dress code for the Castle and prizegiving night. Its just smart casual, no tuxes or medals. Daily running order. On Day 1 everyone will set off in numerical order, that means the earliest car first and latest one last. On Day 2 cars will be seeded, leading car first. On Day 3 again seeded with leading car first. On Day 4 Seeded with leading car running last. Two small amendments to the regulations as follows. The highlighted bits will replace the truck out bits. 17.14 Tests may include such features as:- “STOP” boxes indicated by four markers, forming a box, Competitors must STOP within the box, before proceeding, “STOP ASTRIDE line, a line between two markers where Competitors must stop with both front wheels over the line and both rear wheels behind the line; Passage Check Code Boards where Competitors must stop and write the code on their Time Card in ink before reaching the end of the test. The position of such controls boards will be indicated by a white board with the letters CB in black standard Passage Control Boards -Yellow Advance, Red at Control. An example of the Code Board will be on display at Signing On or at a previously notified location. Additional time will be added for failure to come to a complete stop within a “STOP” box, or to stop correctly at a STOP-ASTRIDE line, or to correctly record a Code. Two attachments, there have been some changes to a couple of crews so throw out the previous entry list and replace with this one. The measured mile that you were given with Bulletin 3 was from an early recee, and has been superseded with a new one, so again please dump your previous one and use this new one. 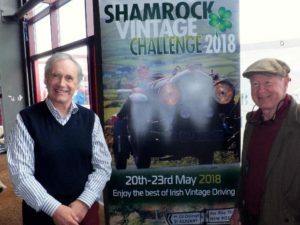 Just two weeks to go, and we are looking forward to welcoming you all in Dungarvan for the first Shamrock Vintage Challenge. This should be your final bulletin before you arrive in Dungarvan so I have a number of bits of information for you. Please read carefully and pass on to your driver/navigator just in case they have missed anything. There is a revised set of regulations attached. To help you see what has been amended or changed, I have stuck out anything that is not now relevant and the replacement or addition is in red type and highlighted in yellow. After this I will tidy it up so the whole thing will be black and white again. Also attached is an outline schedule for the event (this is also in the regs). This gives you an outline of where you will be on each day. All formalities on the Sunday, scrutiny, documentation, driver’s briefing etc will take place in the area of the Park Hotel Dungarvan, where you will be staying on the Sunday night. So please can you arrive on time as we have quite a lot to get through on that morning. At documentation you will be given the road book for the entire four days. This will be in tulip diagram format and will include all information for the route except the regularities and tests. The regularities and tests will be in the form of a Day Book, and there will be one for each day. The Day Books will be available for collection 30 minutes before your due OUT time at the relevant MTC, on each day. This is more to stop crews spending hours on Google maps in their bedrooms when they should be socialising, rather than anything devious on the organisers behalf. While on the subject of socialising. Our night out at Kilkenny castle requires some fairly tight timing so please try to help this work smoothly. When you get to The Lyrath Hotel on the Monday, your bags should already be in your rooms (assuming that you have attached the label that you will be given at documentation). You will have time to ablute and change in time to get on the coach to take you reception in the Long Gallery at Kilkenny Castle. The crews of the first 25 cars will leave Lyrath at 18.30 with the next 25 being collected 25 minutes later. The Finish Time Control (MTC) of the event will be again at Kilkenny Castle, where if the weather is kind will be wonderful venue to finish things off. If you have any friends who would like too see the cars, this is probably the best spot. Also attached is the entry list in car numbers and starting order for Day 1. Please remember all of the requirements for scrutiny (see regulations) especially, correct fire extinguisher, groundsheet etc. As the Easter weekend is upon us, and we will all need some sort of diversion to save us from scoffing too much of that chocolate stuff, I though that I might send you all some notes that your kind competitor liaison officer, Ian McCulloch has prepared for you. These are attached to this email. Most of you will already be used to the various presentations of tests and routes that we will be using, but hopefully this may be of interest to some that may not come across all of these systems. In the meantime all is advancing well, precise measuring has been done (sometimes between high snow banks, which hopefully be long gone by May) and final touches are being made to tests. There are just a couple of bits that may be of relevance to you. Despite a follow up clarification regarding FIVA passports after Bulletin 1, a number of competitors still seem to a bit confused about this. Though FIVA recommend competitors obtain a relevant passport for their cars, this is not mandatory, and competitors will not be in trouble if they turn up without one. There is one place left for anyone that would like to avail of the transport service from Bicester to the start at Dungarvan, and back from Kilkenny to Bicester. If you are interested please make contact with me as soon as possible. There are a number of rooms reserved for competitors at both the Kilkenny HQ (Lyrath) (50 miles from Dungarvan, nicest route via Carrick-on-Suir) and the Dungarvan HQ (The Park) for those competitors that plan to arrive the day before the event. We have arranged for a special rate at both venues, and these are strictly on a first come first served basis. For those that want to avail of a special rate for ferries from the UK, contact Nutt Travel Phone +442870351199 contact Emma. There are still some places on the car transporter from the Oxford area to the start (Dungarvan) and from the finish (Kilkenny) back to Oxford. Price £600. Please contact the organisers. Dear Competitor Following the publication of Bulletin 1, a number of competitors have raised the question as to the requirement to present a FIVA passport at documentation. We have considered the situation and have taken advice. Below is an extra extract from FIVA’s rules and regulations and by presenting the relevant section this to you, will hopefully clarify the situation. As the Shamrock Vintage Challenge is being run under the auspices of FIVA it is our responsibility to encourage participants to obtain an identification card for their respective vehicles. However as the Shamrock Vintage Challenge is a national event rather than an International event, this requirement for an identity card is not mandatory. Hopefully this helps clarify things. It struck me as a potentially worrying portent when, so as to keep my snail’s pace typing to a minimum that, when saving this file, I abbreviated Shamrock Newsletter to SHAM NEWS – I trust that what follows won’t be considered to be the synonymously and contemporaneously sinister FAKE NEWS. When compiling these Newsletters one is faced with the dilemma of who/what to pontificate about. Some of you have provided information on the entry form which provides ready-made copy. Unfortunately, more words than have been supplied are required for these missives, so I feel obliged to fill it out with rather more tangential piffle than I would like. The word “dilemma” appears above. An immediate observation is that the “di” does not mean two – it can be two or more. The “lemma” is even more intriguing (only if you are that way inclined, of course). A Greek word meaning premise, it is usually taken to mean option and an unfavourable one at that. I trust that you will find what follows otherwise. Despite it being maybe a little premature, I would like, on behalf of Irish Racing Green, to offer seasonal felicitations to all (past, present and future) involved in the Shamrock Vintage Challenge. I have already apprised you in previous Newsletters of some of what is in store for you in May. Here is a definite destination on Day 1 – Tourin. 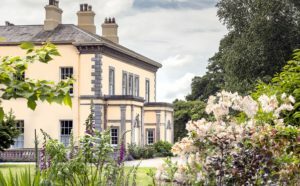 Situated on the banks of the river Blackwater, south of Cappoquin with a fine view of the Knockmealdown Mountains to the North, Tourin is surrounded by arable land and a fifteen acre garden with mature broadleaved trees and a fine collection of shrubs and plants. An Italianate style villa with classical proportions, Tourin House is home to the Jameson family, of Irish Whiskey fame. The present generation – Kristin, Andrea and Tara – are, all three, artists and passionate gardeners. Key member of the organising team Mickey Gabbett has fond memories of this place which he visited more than once in days of yore. I suspect that his rationale was not merely to admire the fine house and magnificent gardens. The Shamrock will definitely have an ulterior motive to drop in as there will be a test for you to enjoy as well as its other delights. Next on the agenda is the1936 Invicta S Type of Paul Gregory & Nick Savage. In the 1950’s, Jack Earle Marsh, S Type Invicta expert and owner of S39, the exworks 1931 Brooklands Double 12 and Ards Tourist Trophy car, started collecting S Type spare parts with a view to building them up on a new chassis. In the 1980s, S39 and the spare parts were sold to Michael Bristow, the Chairman of the Invicta Car Company Ltd., and he had a chassis manufactured to exact original S Type specification by the Invicta Car Company and then a protracted build took place using the original Invicta spare parts. This chassis was numbered S302B (so that there would be no future confusion with Invicta cars built at The Fairmile, Cobham or later at the Flood Street service depot). In 1991 the car was acknowledged by the Invicta Car Club as an S Type and in 1992 the car was purchased by the present owner, Paul Gregory, previously editor of the Invicta Car Club’s quarterly magazine, ‘Invicta News’. The car has been used extensively for club events in the UK, occasional hill climbs and for European touring. 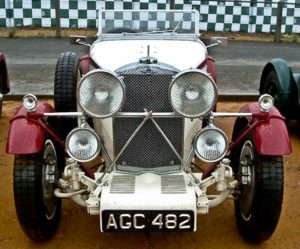 More recently, the car has been used for Endurance rallying, including the Flying Scotsman, the Welsh Three Castles, the RAC 1000 Mile Trial, the Paris-Madrid and the Blue Train Challenge. Friends for over 50 years, the crew comprises two drivers sharing the driving – and no navigator! Both circuit racers with VSCC and HSCC, Paul Gregory has retired from the track but Nick still stalks the circuits in a Chevrolet Camaro. condenser (certainly something very mundane) gave up the ghost on the last test and we dropped from first to about fourth. When you haven’t won does it matter? PS I suspect that none/some/all (delete as applicable) of you will have been dying for a more extended exposition on the topic of lemmas. So as not to discommode those in the first category, I have left this bit till last. In the world of mathematics lemma has a couple of interpretations – the first of which I will regale you with now. (I am saving the other one for the next Newsletter – just to keep you on tenterhooks.) In Number Theory, Euclid’s lemma suggests that — if a prime number p divides evenly into the product ab of two whole numbers a and b, then p must divide evenly into at least one of those whole numbers a and b. For example, if p = 19, a = 133, b = 143, then ab = 133 × 143 = 19019, and since this is divisible by 19, the lemma implies that one or both of 133 or 143 must be as well. In fact, 133 = 19 × 7. As you will probably infer, this is pretty obvious. Nonetheless, little gems like this are often required to prove more grandiose hypotheses. In this case, this property is the key in the proof of the Fundamental Theorem of Arithmetic. Since my last missive, Ireland has had two notable meteorological episodes. The first was a hurricane. I’m not quite sure why female names are usually reserved for these. Also, is the name itself of some significance? Anyway, this one was called Ophelia who, in this context, died fittingly when the willow tree branch she was clutching broke and she fell into a brook and drowned. She was also a little bit too late visiting Ireland to comply with some career advice that she was offered by Hamlet, to wit, “Get thee to a nunnery”. With the fall-off in religious vocations, there are very few nunneries left. Despite Ophelia’s (the hurricane) ferocity, precautionary measures were such that her impact was not as severe as it might have been. She did veer eastwards from her predicted trajectory but passed over/through Shamrock territory without any lasting detriment. A few days later the more benign Storm Brian visited and finished off some trees/structures which had been softened up by Ophelia. The life of this Brian was not as eventful as the more dramatic Pythonesque Brian. The route has been pretty much finalised. As you meander through the byways of Sheets 61, 62, 67, 68, 74, 75, 76, 81 & 82 you will enjoy some challenging roads – wide enough to allow evasive action on encountering random tractors and other potential impediments and importantly, smooth. You might also have to make compulsory visits to licensed premises. The list of nine maps above reminds me that navigating used to be a more compact exercise in Ireland when we used half-inch maps. These were much easier to manage physically though their rather tenuous representation of reality did make maintaining the specified route more of a challenge. The detail on the 1:50000 maps that superseded them, I suppose about 20 years ago, makes life simpler. The good news regarding the nine maps listed above is that you won’t actually need any of them! The route instructions provided will furnish you with the wherewithal to find your way around successfully. I suppose, though, that the more punctilious navigators will feel apprehensive without a set and will be unable to resist the temptation to visit the online OS shop. Neither will you require the dreaded “speed tables”. Again, you will be supplied with all that is necessary to keep you on schedule. And again, I will be surprised if the regular navigators don’t bring theirs along – just in case. To provide some relief from the foregoing disjointed drivel there follows some more details about a couple of cars entered thus far. These details are courtesy of those who filled in the relevant box on the entry form. Rob Jeurissen’s 1934 Bentley Derby is original with matching numbers. The car was rehabilitated to its current state by Elliot Dale and has an ash frame with aluminium panels. Rob has owned this car for four years and has taken part in the Flying Scotsman, 1000 Mile Trial and the Miles of Mystery. Irvine Laidlaw’s BMW 319/1 Roadster was first purchased in 1935 and the car taxed for road use until 1938, by which time the registration document was stamped with swastikas! Little is known of its history until the car was found complete – though in a poor state. In the 1990s it was restored by dedicated enthusiasts but little used until bought by the Irvine from a German dealer whilst looking for a pre-war Alfa Romeo. It is one of 178 examples of the 319/1 produced by BMW in 1935/36. Top Trump Facts: 4,000 rpm, 80 hp, 80 mph flat out. 6 small cylinders, 3 tiny Solex carburettors. I write this not long after the conclusion of the Wolseley Car Club of Ireland’s Annual extravaganza (22nd edition). I was part of the organisational crew led by the super-efficient Philippa Spiller, ably assisted by Andy Bailey. The event was based in Wexford so Andy & Philippa will have been able to get a feel for territory similar to that which will be encountered in May. While the “Wolseley” does require an occasional potato to be tossed into a bucket there are some jogularities and conventional tests to challenge the crews. Others getting “into the zone” – approaching it may be a fairer assessment – on this event were Robert Glover, Peter Little & Louise Cartledge (above left with Louise at the wheel) and Eric & John Kavanagh (below right) . Key member of the Shamrock organising team, Mickey Gabbett, also took part taking a class win with Edwina Gaisford St. Lawrence in his Alvis 12/60. This was despite Mickey’s “con brio” driving technique (his default approach) generating enough turbulence for a time card to become airborne and seek permanent refuge in an adjacent field. The “Wolseley” is sufficiently relaxed that this is not the catastrophe that it would be on other events, Shamrock included (! ), as the results team used marshal check sheets to determine their penalties. Fellow Shamrock organiser Michael Jackson marshalled on Day 1 whereupon he absconded to fulfill his Dolomites commitment with Frank Fennell on the SeaSun Rally, as mentioned in the last bulletin. Let’s hope that Michael’s renewing of his navigational skills will inspire him to devise a testing but fair challenge in May. Other luminaries to sign-up for the trefoil trial include David Smith, Stuart Anderson, John Abel, Martin Neal, Anthony Galliers-Pratt, Irvine Laidlaw, Tom Callanan, James Mann, Mike Thompson and Seán Galvin. Their conveyances are sundry Bentleys & Lagondas, with representation also from Alvis, MG, BMW & Rolls-Royce. Many entrants went to the trouble of providing some “background” when completing their entry forms. I will share some of this information below and in subsequent bulletins. Jayne Wignall will be driving a 1932 Sunbeam 20 hp Sports. This two-seater was built on a 23.8 chassis that was shortened by 12”. The body was designed and built by Geoff Henderson – the project took him six years with completion in the early 1990’s. 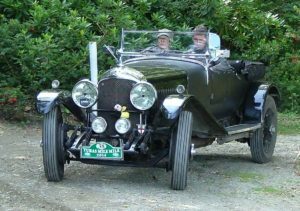 Husband, Paul will be in a 1929 Alvis Silver Eagle that has recently been built up from a kit of parts. Steven Wilson & Trina Harley will compete in a 1948 Morris 8 Series E. Class successes in the Rally of the Tests and the Winter Challenge are amongst their achievements. They have been in Ireland before, for the “Emerald Isle”. David & Anne Marie Smith from Toronto have taken part in the Flying Scotsman and Wolseley rallies in this part of the world. 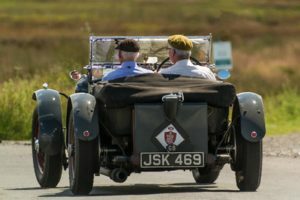 They and their 1933 Alvis 20 SB Cross & Ellis Tourer are a welcome addition to the fray. John Abel’s credentials are impressive – a three time winner of the 1000 Mile Trial. 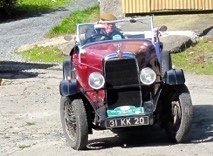 He will bring his 1937 Lagonda LG 45. 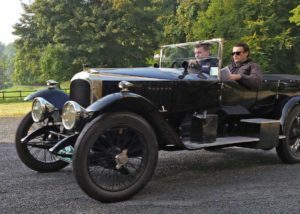 Another 1000 Mile Triallist, as well as Flying Scotsman and Prescott’s regular, is Anthony Galliers-Pratt who will have Charles Young for company in his 1926 Bentley 3 4½. In a tireless endeavour to widen their horizons so as to provide you with the best event possible our intrepid trio are venturing forth into mainland Europe. Mickey is off to the Paris-Prague Rally immediately after the Gordon Bennett at which he will be chauffeur to C-o-C, Fred Bent. To get into a competitor frame of mind, Michael is heading for the Italian Dolomites in September to sit with Frank Fennell in his Volvo Amazon on the Sun Sea Rally. I visited the IVVCC Festival of Transport and was delighted to see Michael Jackson with a prime pitch close to the entrance of the Main Hall. He had a steady stream of visitors during the day, including Henning Thornsen from Denmark. He seemed interested but would be more likely to enter if another three countrymen came along with him to make the logistics a more viable proposition. Maybe he could use a LEGO car – bring the pieces in suitcases and assemble on arrival? Michael is pictured here extolling the virtues of the Shamrock Rally to well-known Irish rallyman, John Farrell. The Irish Racing Green principals have not been idling. The Shamrock Spectacular is never far from their minds. Recently, they have been indulging in exercises to get them in the mood and to hone their skills for the exigencies of next year’s event. Shane has been globe trotting as usual. This will manifest itself in the positive features from other events, which he will incorporate into The Shamrock so as to enhance the experience. He has not been daunted by his recent Flying Scotsman outing which was spoiled by an early mechanical issue. Mickey Gabbett’s Annual Treasure Hunt, in aid of conviviality, took place, in Kilkenny mostly, recently. It allowed him to refresh his memory (at his age, it needs plenty of refreshing) of some of the fabulous roads in the south-east of Ireland. There were reminders of mapping anomalies, e.g. Garryduff Crossroads: also, junctions with “triangle” combinations to liven up the regularities. Michael Jackson is in the throes of finalising the 2017 Gordon Bennett Rally arrangements. This year the rally is being run over terrain, some of which is Shamrock appropriate. All sorts of strengths, complementary to those needed for the Shamrock, are being exercised. Shane and Mickey are, of course, also intrinsically involved in this event. So fear not! Your 2018 Vintageant Adventure is well in hand. The important details, like hotels and many of the test locations, have already been arranged. Joining the dots to best effect is all that remains. You can be sure that the links will be challengingly obtuse.